4 posts categorized "Peace by pains aux raisins"
Can too much butter be a bad thing? Sometimes you have to go above and beyond the call of duty. I know I said I would attempt to stop partaking in my one-man peace corps, but recently I had very little choice but to help bring harmony to the world. I was at a breakfast meeting at The Wolseley and it would have been rude of me not to have eaten something. So I chose a pain au raisin. It was exceptionally good - in fact rather too good. It was a bit too airy and light - demonstrating a judicious use of butter. If I'm honest, I thought it a bit girly. Although, I reckon there were more calories in it than half the waifs in the restaurant eat in a year. This was a good specimen but I've decided I like mine to have a bit more density than the buttery fluffiness (that does sound good though, doesn't it?) on offer. It was worth the calories though. Apologies for the lack of a poor quality photo. I didn't feel comfortable explaining to my client why I was taking a picture of my plate. I need to lose weight. I know I do. The last time I was properly slim was when I did a ski season in Vail, Colorado. It didn't matter what I ate because I was skiing every day. Although it is tempting to return for another svelte-inducing season, I'm not sure Silverbrowess or the boss would be too impressed. Basically, I need to go the gym. I hate the gym, but unless I want to buy a new wardrobe (which I don't) it is an evil I am going to have to endure. I wish that I could properly kick-start my diet by cutting out unhealthy food, (un)fortunately I rarely eat anything really unhealthy. I'm not a chocolate fan, I can't stand fast food. I probably do eat too much of good food and I don't exercise nearly enough. So, quite simply, if I want to continue my love affair with good food, I need to go through the purgatory of an exercise regime, either in the gym or elsewhere. What got me thinking about this (apart from the shirts that are a little tight around the neck) was a recent stroll along Upper Street. Upper Street is the main thoroughfare of Islington, an area of London that one way or another, elicits groans - people love it or loathe it. I'm growing to love it. One reason for my new kindled relationship is that I was reminded that it is the home of Euphorium, a truly fantastic bakery. Seeing Euphorium reminded that I have not been putting my all into my personal attempt at fostering world peace: discovering the ultimate pain aux raisins. I instinctively felt confident that Euphorium might make the Kofi Annan of pain aux raisins. At the time, I was with Silverbrowess and I would have been on the receiving end of significant tutting and murmuring had I tried to buy one of these totems to love and the free world. She doesn't get the importance of finding world peace, you see. However, this morning on my way into work and free of the shackles of despots, I was able to nip in and pick one up. I was right, oh so right. This was a fine example of the species. It was slightly warm when I bought it, it was soft but not doughy, sweet but not sickly, enough raisins to keep you wanting more and enough butter in the dough to keep a cardiac surgeon occupied for some time. True, it had an unusual hit of candied orange peel, which some might consider outre, but I felt added depth and sincerity. I could eat one of these every day, several times a day - but then I'd be in real trouble. Personally, I don't consider this to be too unhealthy (no preservatives, additives or the like) but I realise it is fattening. So, if I want to continue my odd foray into world peace, I appreciate that I have to go to the gym, or at least do some real exercise - more than the one hour daily stroll I currently undertake. It's not going to be easy, but if it means that I can justify eating another one of Euphorium's pain aux raisins, then it will be worth it. This is a fantastic lunch time venue. The earlier issues I had have now been dealt with. I urge you, if you're in the City and don't want another stodgy mayonnaise laden Pret sandwich then this the place for you. Especially at the moment as it hasn't really been discovered by the raging lunchtime hordes and so for the time being, it isn't too busy. The only faults I can find is that the menu isn't brilliant for those of us looking for that vege option, but I appreciate that in the middle of the City, meat sells. My only other issue is that I feel they could better serve one's cravings: they need more chocolate at the tills, or carb loaded food to ease along the tequila induced hang-overs. Minor quibbles really. One closing word on the pain aux raisins. Admittedly, this is a bit of a fetish of mine, but the one's at Leon are fantastic, they're buttery with a decent helping of custardy goodness inside. Crucially, they are baked too perfection. Some bits are crispy and just shy of burned, other bits are soft and gooey. If nothing else, one of these during the day ensures all is well with the world. For those of you berating yourselves for not being near either the West End or City branches, I hear they might well open up in the Knightsbridge neck of the woods. There is a theory that no two countries with a McDonald's will go to war with each other, the theory is based on the idea that if everywhere becomes sufficiently homogenised we won't want to bomb the living daylights out of each other. My own personal take on this is that it is more likely that no two countries who can make decent pain aux raisins will go to war with each other. If people were busy perfecting the sublime combination of dough, raisins, sugar and a bit of posh custard, they would be far too engrossed (both mentally and physically) to care about bombing the living daylights out of each other. It is for this reason that I consider a good pain aux raisins to be a very important thing and why I like Gail's so much. It's a bit tough to describe what Gail's is, as it's more than a baker, more than a coffee shop but not quite a deli. It's like Starbucks but with good coffee and homemade cakes, or another way to put it is that it's like it's near neighbour Maison Blanc, but not quite as poncy and fewer folderols. Gail's is in some how related to Baker & Spice - a very good bakery - in Queen's Park. My understanding is that whilst a lot of the baked goods at Gail's are made on site, quite a few of the cakes are brought over from the larger Baker & Spice in Queen's Park. 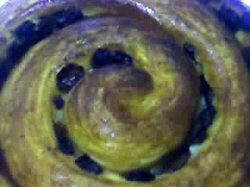 My pain aux raisins was one of the things baked on site. It was flaky, with a good density of raisins, a lot of butter and not too much sugar. Unlike my trip to Maison Kayser, it hit the right note. Apart from a coffee I didn't have anything else there, but the bread looked excellent and interestingly they sell milk from Daylesford Farm and other well sourced organic products. They also have a small book section and when I was browsing through the selection one of the bakers came out to talk lovingly about the books. This is an excellent place for either a take-away cake, some top notch bread or simply a coffee to watch the world of Hampstead drift by. In some ways, it seems more suited to the culinary heaven that is Marylebone High Street, rather than the increasingly commercial Hampstead High Street. Nonetheless I hope they do well and if it doesn't work out, I think they should be sent in as crack squads in global peace negotiations, pain aux raisins at the ready. If they did, peace and serenity would reign. As far as I can tell, no-one's got there before me.